By this time you may be wondering what you have to look forward to as a member of Alpha Phi Omega. Well, after tuning into APO IMPACT: Pledge Today – part one of this two-part series – you will have learned about both APO and pledgeship. Now it’s time to discover the endless opportunities that await you as an active member of the Fraternity. APO IMPACT is Alpha Phi Omega’s national training program to give chapter leaders and alumni volunteers the skills needed to run healthier and more productive chapters and committees. 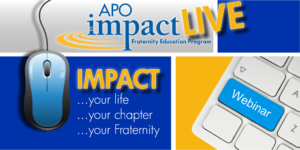 APO IMPACT Live is a series of live webinars facilitated by APO alumni that have experience within in a particular organization topic. Sessions are available to all members and include various topics such as; risk management, officer transitions, leadership development, national Fraternity programs, and so much more. Participants of this ACHIEVE course! The course evaluation is available at the link below. Please copy and paste into a new browser window to complete. thu25apr8:00 pm10:00 pmAPO IMPACT LIVE: So Your Chapter Received a Consultant Visit...Now What? APO IMPACT LIVE: So Your Chapter Received a Consultant Visit…Now What? Congratulations! Your chapter completed a visit with one of the Fraternity’s Chapter Consultants, and has surely learned a lot over the past few days, weeks or months. The Chapter Consultant Team is here to help you digest all you’ve learned and to provide you the next steps to keep your chapter on a path to success. © Copyright 2017. Alpha Phi Omega. All Rights Reserved.